"Marash" redirects here. For other uses, see Marash (disambiguation). "Germanicia" redirects here. For the Phoenician port, see Acre, Israel. Kahramanmaraş is a city in the Mediterranean Region of Turkey and the administrative center of Kahramanmaraş Province. Before 1973, Kahramanmaraş was named Maraş. The city lies on a plain at the foot of the Ahir Dağı (Ahir Mountain) and has a population of 1,112,634 as of 2017. The region is best known for its distinctive ice cream, and its production of salep, a powder made from dried orchid tubers. It is connected by air to İstanbul and Ankara. Turkish Airlines has daily direct flights from İstanbul and also AnadoluJet operates direct flights from Ankara. In the early Iron Age (late 11th century BC to ca. 711 BC), Maraş was the capital city of the Syro-Hittite state Gurgum (Hieroglyphic Luwian Kurkuma). It was known as "the Kurkumaean city" to its Luwian inhabitants and as Marqas to the Assyrians. In 711 BC, the land of Gurgum was annexed as an Assyrian province and renamed as Marqas after its capital. Maraş was called Germanicia Caesarea (Ancient Greek: Γερμανίκεια, Germanikeia) in the time of the Roman and Byzantine empires. According to a 2010 Cumhuriyet article, the first ruins of Germanicia have already been unearthed in the Dulkadiroğulları quarters of the city. In 645, Germanicia was taken from the Byzantines by the Muslim Arabs, to whom the city was known as Marʻash (Arabic: مرعش [ˈmarʕaʃ], which is also the Syriac ܡܪܥܫ). Marash was an important Syriac Orthodox diocese; Mor Dionysius Bar Salibi (died 1171) was its bishop. Over the next three centuries, Marash belonged to the fortified Arab-Byzantine frontier zone (Thughur) and was used as a base for incursions into Byzantine-held Asia Minor by the Arabs. It was destroyed several times during the Arab-Byzantine Wars. It was rebuilt by the Umayyad caliph Muawiya I and was expanded ca. 800 by the Abbasid caliph Harun al-Rashid. The city was also controlled by the Tulunids, Ikhshidids and Hamdanids before the Byzantines, under Nikephoros Phokas, recovered it in 962. Germanikeia was captured by Baldwin I of Jerusalem in 1098, during the First Crusade, and made part of the County of Edessa, becoming an important center during Crusader rule. According to the Chronicle of Matthew of Edessa, it was destroyed by an earthquake and 10,000 people were killed, which is probably an exaggeration. In 1100, it was captured by the Danishmends, followed by the Seljuks in 1103. In 1107, Crusaders led by Tancred retook it with aid from Toros I of Little Armenia. In 1135, the Danishmends besieged Germanikeia unsuccessfully, but captured it the next year. However, the Crusaders retook it in 1137. Baldwin of Germanikeia died in a war in 1146, while trying recover Edessa Nur ad-Din Zangi, which had taken the side of Joscelin II of Edessa. His successor Reynald of Germanikeia also died in the Battle of Inab against the Zengids. Sultan Mesud I of the Sultanate of Rum took the city in 1149. Marash was captured by the Zengids in 1151, but was recaptured by the Seljuks in 1152. Maraş was recaptured by the Zengids in 1173 and was left to Mleh, his collaborator. Marash passed to the Seljuks in 1174 and to the Ayyubids in 1182. Kaykhusraw I, Sultan of Rum captured Marash in 1208. Seljuk rule lasted to 1258. In 1258, Maraş was captured by the Armenian Kingdom of Cilicia, following the war with the Ilkhanate. Served by an Armenian Apostolic Church Archbishop, it became for a very short period of time, the seat of the Catholicossate of the Great House of Cilicia. Marash was captured by Al-Ashraf Khalil, Mamluk Sultan in 1292. But, it was recaptured by Hethum II, King of Cilician Armenia in 1299. Marash finally was taken by the Mamluks in 1304. 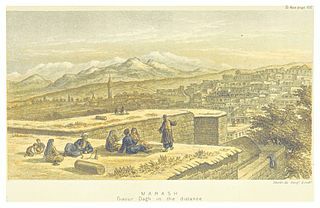 Marash was ruled by Dulkadirs as vassals of the Mamluks from 1337–1515 before being annexed to the Ottoman Empire. In the early days of Ottoman rule (1525–6) there were 1,557 adult males (total population 7,500); at this time all the inhabitants were Muslims, but later a substantial number of non-Muslims immigrated into the city, mainly in the 19th century. During Ottoman rule, the city was initially the centre of Eyalet of Dulkadir (also called Eyalet of Zûlkâdiriyye) and then a sanjak centre in the Vilayet of Aleppo. Marash was controlled by British troops between 22 February 1919 and 30 October 1919, then by French troops after the Armistice of Mudros. It was taken over by the Turkish National Movement after the Battle of Marash on 13 February 1920. Afterward a massacre of Armenian civilians took place. Roving Turkish bands threw kerosene-doused rags on Armenian homes and laid a constant barrage upon the American relief hospital. The Armenians themselves, as in previous times of trouble, sought refuge in their churches and schools. Women and children found momentary shelter in Marash's six Armenian Apostolic and three Armenian Evangelical churches, and in the city's sole Catholic cathedral. All the churches, and eventually the entire Armenian districts, were set alight. When the 2,000 Armenians who had taken shelter in the Catholic cathedral attempted to leave, they were shot. Early reports put the number of Armenians dead at no less than 16,000, although this was later revised down to 5,000–12,000. In 1973, Marash's name was changed to Kahramanmaraş when the Turkish government added "Kahraman" to the name, in reference to the bravery of the people of the city in resisting the French occupation after the First World War. Kahraman means "hero" in Turkish. In December 1978, Kahramanmaraş was the site of a massacre of leftist Alevis. A Turkish nationalist group, the Grey Wolves, incited the violence that left 800–1000 dead. The incident was important in the Turkish government's decision to declare martial law, and the eventual military coup in 1980. Kahramanmaraş has a mediterranean climate (Csa). Summers are hot and dry with an average of 35 °C (95 °F) but can go higher than +40 °C (104 °F). The highest recorded temperature being 45.2 °C (113.36 °F) on 30 July 2007. Winters are cold and damp with temperatures ranging from 0-5 °C (32-41 °F). The coldest temperature recorded was -9.6 °C (14.72 °F) on 6 February 1997. Several internationally-known ice cream companies, like MADO, Yaşar Pastanesi, EDO and Ferah Pastanesi, started their business in Kahramanmaraş, and thousands of people visit the city because of its ice cream (dondurma in Turkish). The city has a local football team, called Kahramanmaraşspor, which plays in the Turkish 2nd Division league. Kahramanmaraşspor plays its home games in Hanefi Mahçiçek Stadium. Some famous Turkish players like Mehmet Özdilek and Kemalettin Şentürk played in Kahramanmaraşspor before transferring to bigger clubs. ^ Payne, Annick (2012). Iron Age Hieroglyphic Luwian Inscriptions. Society of Biblical Lit. ISBN 978-1-58983-658-7, p. 7. ^ "Eyewitness Tells How Armenians were Massacred." The New York Times. 29 February 1920. ^ Sahakyan, Ruben G. (1970). Turk-Fransiakan haraberutyunnere ev Kilikian 1919-1921 tt. [Turkish-French Relations and Cilicia, 1919-1921]. Erevan: Armenian Academy of Sciences, pp. 150–52. ^ Documents on British Foreign Policy, vol. vii, p. 303. ^ Kerr 1973, p. 196. ^ "Kahramanmaras". Dokuz Eylül University. Retrieved 6 March 2014. ^ "İl ve İlçelerimize Ait İstatistiki Veriler- Meteoroloji Genel Müdürlüğü". Meteor.gov.tr. Archived from the original on 2009-02-19. Retrieved 2017-04-18. This page was last edited on 30 March 2019, at 04:49 (UTC).